It’s now been almost 3 months since our oldest son was married and we are finally starting to see the photos from the day. While I recognize that it’s heartwarming for the family and close friends to revisit a happy occasion by reminiscing through the photos, I wonder whether the rest of the world finds it just as interesting, or if it’s merely a common event with different faces and clothes. There is however one part of Jordan and Dempsey’s day that I wanted to share because I had never witnessed it before and I loved the symbolism it represented. It’s called the Veil, Cord, and Coin Ceremony. Our new son-in-law is from the Philippines and the young couple decided to include this piece of Filipino tradition into their day. Weddings are all about symbolism and it seemed like a very appropriate thing to do. In a traditional wedding, after the vows and rings are exchanged, the bride’s veil is draped over the groom’s shoulders. This symbolizes their oneness and introduction to the world ‘dressed’ as one. 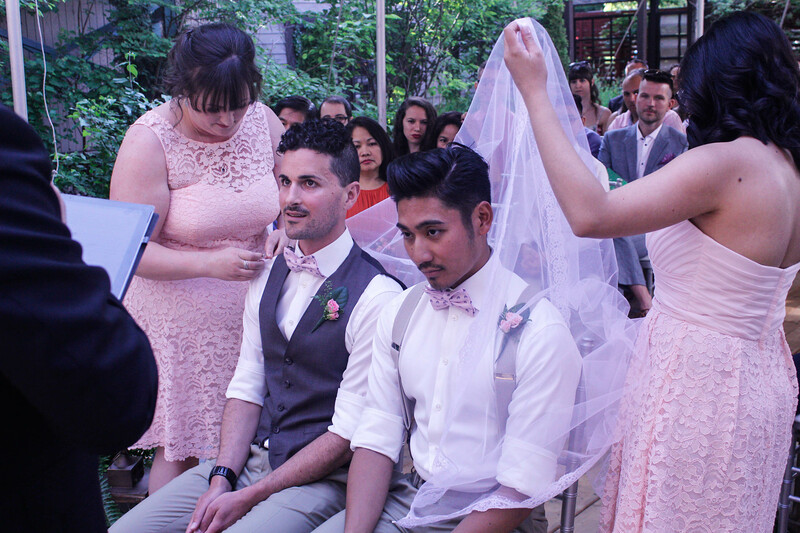 With no bride in the ceremony, a veil was provided and pinned to the shoulders of the two grooms … although if you had asked Jordan, he would have preferred to call it a cape. Then a white cord is placed over their shoulders in a figure eight design to represent infinity and the bond of fidelity promised to each other. Lastly, a bowl with 13 gold coins is introduced – or in this case, highly polished ‘Loonies’, the Canadian $1 coin. … and no, the name Loonie doesn’t mean it’s a piece of folly, but rather is a nod to the bird – the Loon – on the back of the coin. 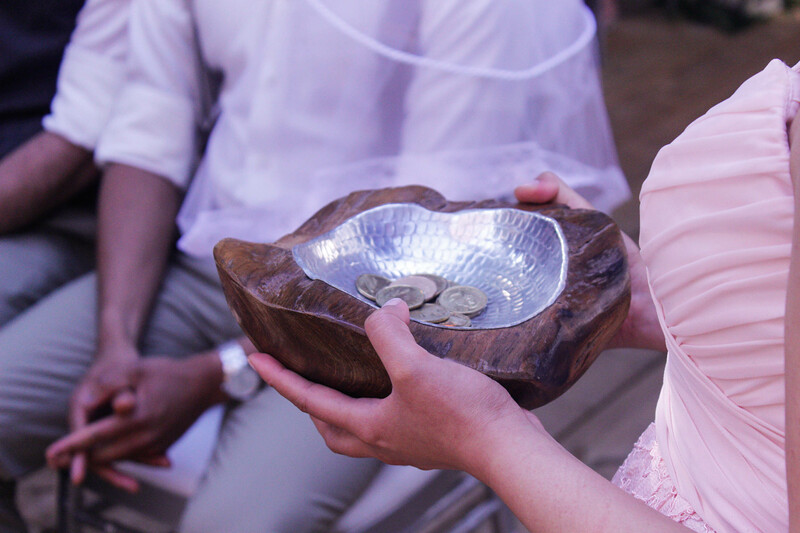 The coins, symbolizing the hope of a future with mutual support and prosperity, are then passed between the hands of the wedding couple. In this case, Jordan and Dempsey kept passing the coins back and forth between them several times. They were clearly having fun with this. Meanwhile I was holding my breath in superstitious fear that they would drop them and invoke bad luck. I had hoped the 13 coins would have some thoughtful significance like 13 key values or virtues, but was disappointed to find only references to Jesus and the 12 Apostles. It may be just my shrivelled little agnostic soul speaking, but that’s a lost opportunity in the symbolism department. In the end, their untraditional marriage was full of traditional elements and having now experienced the wedding of one of my children, I appreciate that these small customs – in whatever form they take – impart huge meaning in our lives. Note – none of the photos in this post belong to me. They were taken by the wedding photographer, Brianna Premo, hired for the occasion and used with permission given by my son. Such a handsome couple and I do love their outfits. Weddings can potentially be run of the mill – what makes them stand out in our memories I think, are things that a couple personally finds meaningful that they share with the witnessing guests as these two chose to do. So glad you shared your son’s wedding tradition. I find them fascinating, and this one is new to me. I love the symbolism of the veil and cord, and the coins as mutual support and prosperity, but I would look beyond the Christan symbolism too. Yeah – I’ve long believed that we should keep what works for us and leave the rest. I agree, with you, Joanne. I too love the traditional elements being infused to this non-traditional wedding and am happy to have a seat at the head table (albeit virtually). This second visit to Jordan and Dempsey’s nuptials brought a smile to my face this morning. As you know, motherhood was more adventure than I ever thought I could handle, but it is lovely to experience the rewards of that adventure here. Congratulations to then young couple. All the joy in the world to them! Sorry — I enjoy that kind of trivia. Hugs. What a beautiful wedding! And I loved the traditions. They look very happy together! Those traditions sound and looked lovely, and fun. It was wonderful that they included them in their ceremony. They look so handsome. It looks and sounds like it was an amazing wedding day. Happy occasions stay in our heart. This is one day that I will always remember with great love. What an awesome tradition…I love traditions! I like seeing how traditions can be imported and adapted and still have meaning for those involved. It seems like it was a beautiful ceremony. Thanks for sharing a lovely tradition. I was very aware of symbolism in my own wedding (many years ago) and it’s delightful to hear about ones from other cultures. I truly hope they don’t die away. And, it’s also lovely of you sharing the joy of the day. I too love the ties! Symbols play a large part of our lives and the real magic starts when we do finally notice it. How very lovely to incorporate that lovely tradition. I laughed at the veil to cape preference and both lads look distinctly nervous about that cord being strung around their necks! But they seemed to enjoy the passing of the coins. I wish them a wonderful, happy and joyous life together through the good times and those more stressful ones which life seems to throw at us all. 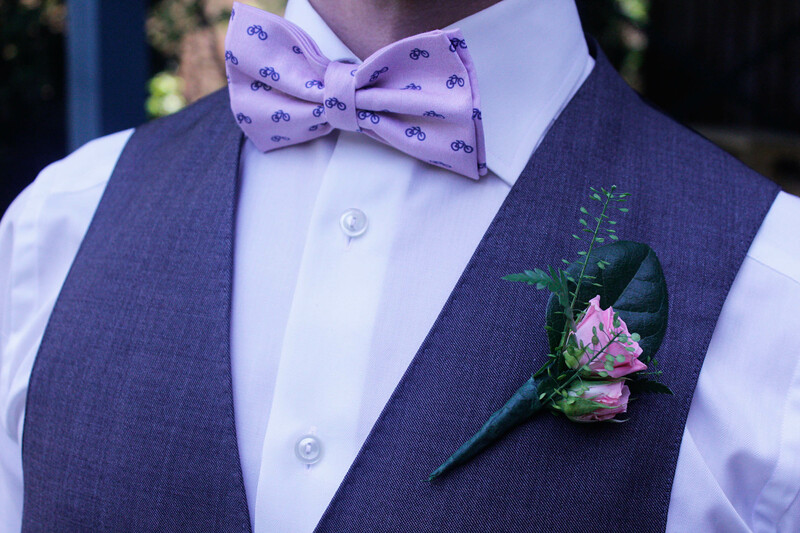 The bow ties are a wonderful touch! I’m glad they didn’t strangle them both! As long as there are enough people who want to incorporate elements of traditional practices, hopefully these precious ceremonies will survive. 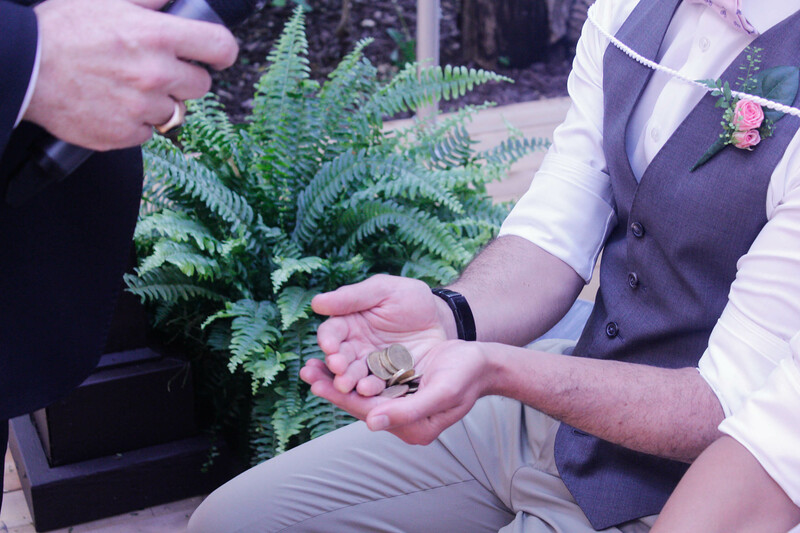 I expect some of the symbolism will change though – and it should, like the Coins used to represent the Groom’s promise to take care of the Bride and their future family. I much prefer the modern interpretation of mutual support. I missed your special moment. Dr Perry is your son? Is there a blog post you can reconnect me to? oh no – he is just a random blogger. well not random. anyhow, he has like 10,000 followers and it was just fun to see him finish up and the he shared was fun. Tradition and symbolism are so important! Well done to them for incorporating these elements into their special day, and blessings on their marriage! Very cool! And a great way to start things off right with a blending of traditions. I think weddings should be as special and unlike “everyday life” as possible; packed full of ceremony and tradition and symbolism. Otherwise why bother? I love that your son and his husband chose to include elements of your son-in-law’s culture — and that they had fun with it! Yay for embracing celebration and building wonderful memories. I think weddings are by definition special occasions and it’s fun to see how different couples approach their special day. 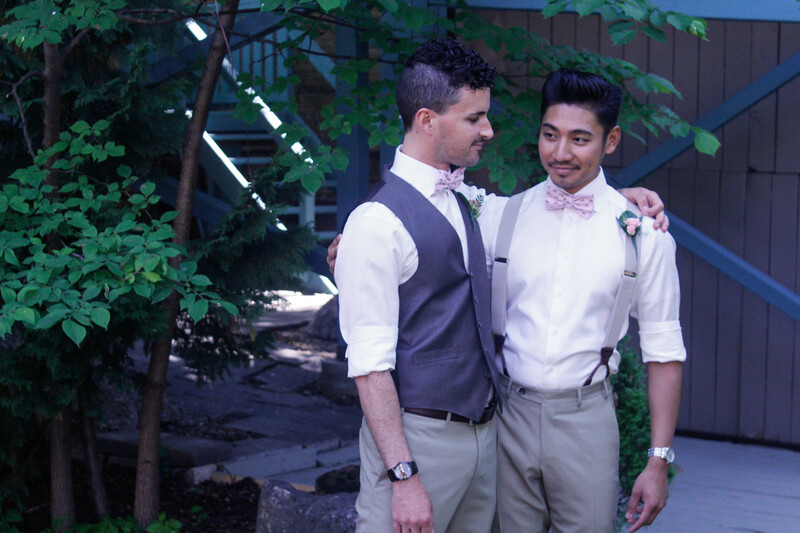 My favourite weddings have been the ones that were a little different – that reflected some characteristic unique about the couple. Not necessarily something complicated or showy but something small that made me smile and think ‘yes, that’s them’. Thanks for sharing this ceremony. I had not heard of it. Like you, I wish the 13 coins stood for something more than what they do. I love when people honour their heritage and traditions and merge cultures as well as lives. Hope to see more pictures on the blog! I love weddings. Ahhh – I think it’s the romantic in us that love weddings. Each one is special whether it is buried in pomp or simplicity and I love them all. Lovely ceremony. 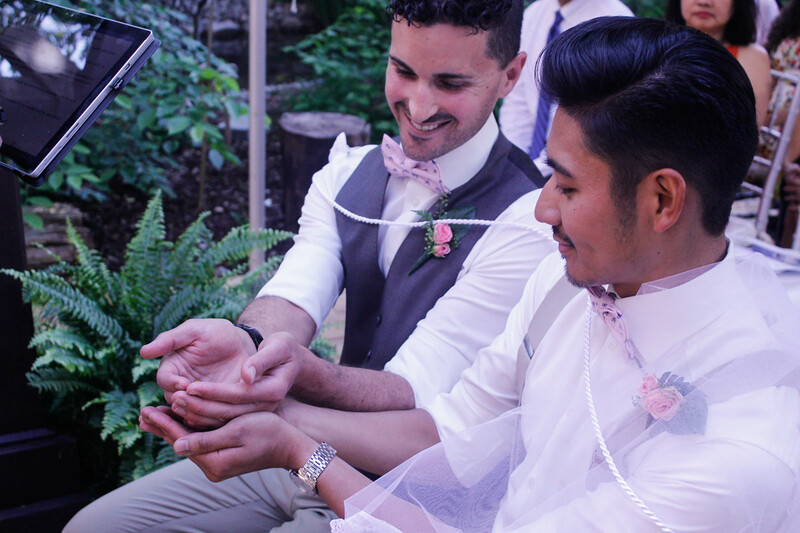 I love seeing wedding photos, especially ones that introduce unique ceremonies and traditions! I think its wonderful that you’re sharing posts about your son’s marriage and the blend of traditions. We need more of this! Thanks Tracey. As much as I love reading posts where other’s have shared about their personal lives, I’m still not quite there myself. It feels awkward to me. That tradition is new to me, and I like it. I don’t think anyone tires of wedding photos when the couple looks so happy, as they do. Weddings are wonderful occasions. Everyone is happy – what’s not to love? hehehe! Thanks Diana. Every once in a while I’m particularly proud of a string of words I put together and this was one of them 🙂. I didn’t want to offend anyone’s religious leanings, but …. Nice photos and sentiments. My wife and I got married in a courthouse, by a government clerk, at a cost of about $100. This symbolized our love of simplicity, and thriftiness. And it has worked out that way also, as our marriage has been mostly uncomplicated, and we’ve rarely had financial difficulties. Isn’t that what it’s all about? … a ceremony that reflects the couple? It’s a rare couple who can say they’ve rarely had financial difficulties throughout their marriage. Clearly the 2 of you brought shared values into the relationship! Kudos!! Thanks. Yes we do have similar values in a lot of ways. And our differences complement. I think the chemistry has helped things work out for us as long as they have. What a lovely tradition. I always enjoy learning about different wedding traditions. And, yes, we all enjoy those photos! What an interesting tradition. I have never heard of it. It was new to me too and I was instantly curious about it when they first brought it up. I love the symbolism of these traditional practices. It’s a heartwarming ceremony, Joanne. You described it well; I felt as if I were there, too. Thanks for sharing this precious moment with us. And congratulations! For those of us who had never seen this ceremony performed before, it was very interesting. Interesting ceremony! My daughter was in a Hindu ceremony once and we really enjoyed learning all about their traditions as well. That would be really interesting! It would be another first for me too. contd … feel constrained by what others view as traditional. You expressed it very well – picking the parts that mean something and leaving the rest. I think there is a lesson in there for us in most things we approach in life. I love learning about different traditions and the meanings behind them. I also loved seeing the joy in these photos. Thank you for sharing them, Joanne! Sometimes the meaning of a particular act can get lost in the hype of the day. I witnessed the ceremony and yet it was still a blur. Researching it afterwards made it come alive for me. Beautiful post Joanne. I love seeing other people’s wedding photos and look forward to seeing all of them! I so love traditions and the symbolic meaning behind them. This is quite beautiful, Joanne. The bowties with the bicycles….they met cycling? Of they both like to bike? They are both very active and outdoorsy people. They both embraced cycling around the same time and love the sport. It’s become a huge part of what they do together. As a result, the bicycle became a theme of their wedding. 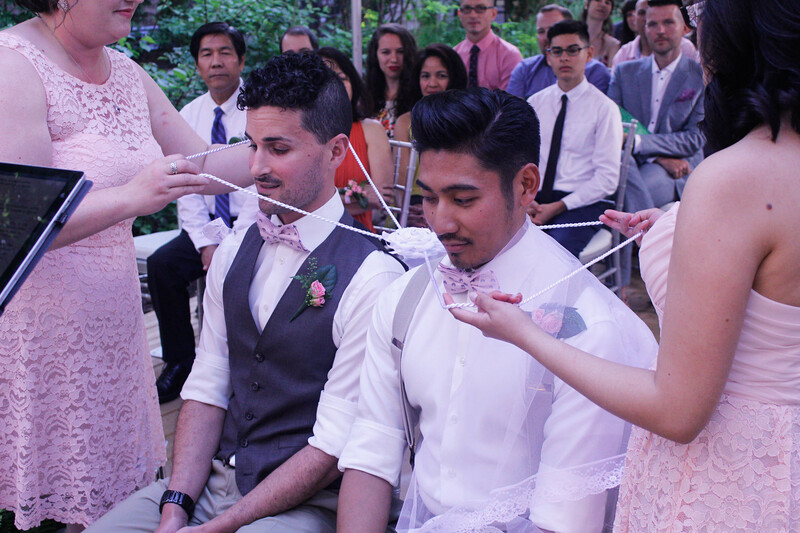 I love that not only were two people joined in the ceremony, but two cultural traditions as well. And, by the way, if you’d like to share more pictures of the wedding, please feel free! Very interesting, Joanne. As you say, symbolic gestures mean so much. And it’s great to see the photos of your son’s special day. Love the tradition. It was new to me! I wonder if it’s a dying tradition now. So many of these traditions are seen as archaic and abandoned by younger generations. I know the weddings in my family that I attend no longer do the old Austrian traditions that were prevalent when I was a kid. That’s kind of sad, although I’m already noticing that in some things, everything old is ‘new’ again. Maybe you should write about some of those Austrian traditions. I for one would be interested in reading about it – especially if you had incorporated them in your own wedding. I got married in Las Vegas so sadly I did not. Have you ever considered a renewal of vows as part of a special milestone anniversary? I’ve often wondered if marriage would be treated as something more precious if it was a license that had to be renewed every 5 or 10 years. Instead of couples staying together out of habit, it would be a deliberate conscious decision. I can’t help but think that generally people would be happier. I had a friend who always lobbied for marriage renewal but I think she was interested in finding a new partner. I love this posting and your wonderful commentary. Congratulations to the happy couple and thanks for sharing your description of the elements of the ceremony and their meaning. Thank you! I thought it was very interesting and I hoped others would too.